Pegasus Rising Therapeutic Equine Program Bake Sale! Mary’s is so excited to be partnering with Pegasus Rising, a fantastic organization offering Equine Assisted Therapy (EAT) to members of our military, many of whom are coping with Post Traumatic Stress Disorder or Traumatic Brain Injury. The horses in the Pegasus herd, who themselves have suffered abuse in the past, are naturally empathetic to the anxieties exhibited by the military personnel and are able to mirror and interact in a unique way with the individuals seeking therapy. It is an absolutely beautiful partnership. We at Mary’s Tack and Feed are particularly fond of Pegasus Rising because they are committed to offering their services at no cost to the military personnel seeking therapy. Isn’t that awesome? Plus, every single penny donated to their organization goes directly toward caring for their horses. Not a bit of it is allocated to administrative costs. We love that! So to support this wonderful organization and the work they do, Mary’s is proud to be hosting a fundraising bake-sale this weekend! Join us on Sunday, December 9th, 2012 from 11 a.m. ‘til 3 p.m. at our Del Mar location. Pick up some delicious treats and help continue the important work that Pegasus Rising is doing for the members of the U.S. military in our community. Can’t make it between 11 and 3? The entire day Sunday (10am – 5pm), you can also donate by cash, check or charge through Mary’s cashiers to Pegasus Rising. Pegasus Rising is a 501C3 charitable organization, and every penny will go directly to the care and feeding of the horses! Sunday 12/9/12 11 a.m.- 3 p.m.
Matrix T3 Saddle Pad Giveaway! 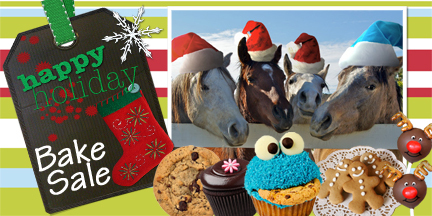 Win $100 to Mary’s Tack and Feed!